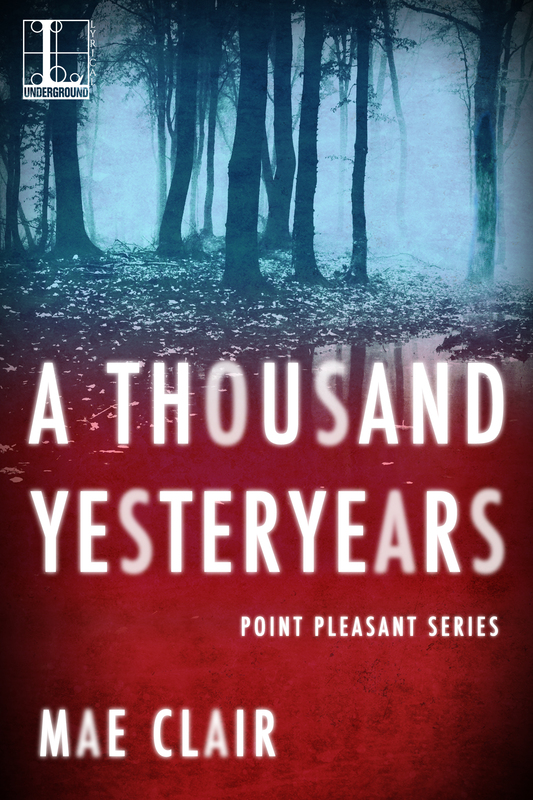 This entry was posted in Book Release, Cover Reveal, Series Books and tagged A Thousand Yesteryears, Lyrical Underground, Mae Clair, Mothman, Mystery, Point Pleasant, Point Pleasant Series, Silver Bridge, Suspense by Mae Clair. Bookmark the permalink. Eeek, it looks eerie and ominous. *covers eyes* I’m so happy for you, Mae. I know the next 4 months will fly, and we’ll be toasting your new release! Congrats! Thanks, Donna 🙂 I still get a thrill out of every cover reveal I do and I’m really super excited about this one. It is eerie, isn’t it? You can peek now and again, LOL! Congratulations, for you first, and to the cover artist! I can hardly wait to find out the new Mae in this story. If you need a place to promo the cover, you know where I am. Warm hugs from a frozen place! Thanks for the invitation, Carmen. I will put something together and send it over to you. And I have to get busy writing blog posts for the release. The next four months will likely fly by. At least by April it will be warmer for both of us, LOL. I woke up to snow flurries this morning, which snow is probably looming around the corner! Beautiful, yet haunting cover. It looks and sounds great. Congrats, Mae! Thanks, L.J. I’m really excited about this one. It grew from a Mythical Monday blog post I did on the Mothman back in 2013. I can’t believe how far my interest in Point Pleasant, the Silver Bridge and the Mothman has evolved since then! I love it, definitely has the mystery vibe. I can’t wait to dive in to your Point Pleasant series. I remember your post about your visit to the town to check out the Mothman legend firsthand. Happy New Year, Emma. Those trips to Point Pleasant definitely helped in crafting this book and the otherr two yet to come in the series. Immersing myself in the setting really helped. So glad you’re looking forward to this one! It looks great. Can’t wait to read it. Great cover! As a native of the area, I can hardly wait for this series. Hi, Teresa! It’s so wonderful to have you drop by. Do you live in Point Pleasant? I took two trips there (2013 and 2015) to do research on the area. Loved visiting the town and seeing the TNT first hand (very spooky). I’m super excited to have someone who lives there read the series! Great! Looking forward to the read. Thanks, Susan! I’m delighted to hear you’re looking forward to it! Check out this awesome cover to a book I’ve been looking forward to. Yay! Thanks so much for the reblog and helping me spread the word. I really appreciate your wonderful support! Thanks so much! It’s great to have you visit and check out the cover. I love this series and hope others will, too! Definitely ominous, Mae Clair! Not my usual genre either, but I like the sound of this one… as soon as you mentioned the words ‘lots of research’ and real events in history, you had me hooked! 😁😂😄 Great cover, and great way to launch the new year with the publication of a new book! Lol! Looking forward to it! Wow Mae! I just love the cover and I’ve heard about Mothman on the Destination channel. I don’t remember, but isn’t he in New Jersey somewhere, or am I confusing him with the flying unicorn-dragon thing? Whatever, I am so excited and have a room open on the Ranch anytime you want it. Happy New Year! It’s great to hear from you! Ooo, how about jasmine or honeysuckle? I can already picture getting comfy on the ranch for s stay.Maybe I can even convince the Mothman to tag along, LOL! I love the sound of this book Mae and I’ve added it to my Goodreads ‘want to read’ list! BTW, the cover is awesome too! Ooh, can’t wait for this one! Did I mention I’m a big Mae Clair fan????? It’s a great cover. I’m pretty jazzed about your series too:) If you want to run the cover at my place just send it over. Oooh, thank you. I think I’m going to hold off a bit until closer to release time and then I will definitely come calling. Yipeee! Beautifully atmospheric. I love it. Congratulations, mae. Thanks, Daisy. It has such a different look than any of my older novels, but I really love it! Sorry to hear you’re feeling puny:( Are you taking your Vit C and Zinc? …..Possibly hot toddies. Just checking in to see how you’re feeling. Much better, thank you! Working on blog posts, writing and editing. Not much lounging, but that’s okay because I’m behind on the other things. Hey, just finished Queen of Diamonds and left reviews on Amazon and GR. That was a blast! Gorgeous, Mae! I so admire your fortitude and perseverance with getting the books out. Thanks , Flossie. It’s a struggle staying on top of the books, but so rewarding. I’m really excited about this one. I’m in! Love the cover, love the blurb. Adding to my TBR now. Can’t wait! I can’t wait! And that cover is awesome. Just the right amount of creepy. Thanks, Lauralynn. Creepy works great with Mothman. I’ve got a lot of weirdness planned with this series, LOL. I’ve read three of your books so far. Fantastic writing by a fantastic author. Love your cover. I’ll “Amen” Lauralynn’s post and agree the cover depicts just the right amount of creepy. Bet it’s going to be a good one. Sorry I’m late in responding to this comment. The snow storm did a number on me, LOL.